Seriously, Mom! 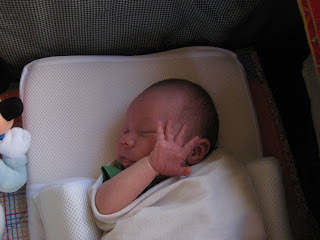 Stop with the pics!! 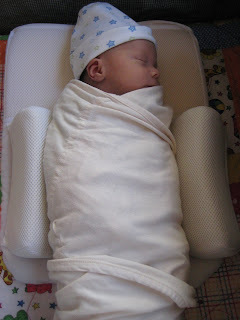 Does this outfit make me look like a burrito? 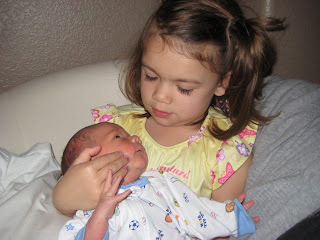 Brooke has been an AWESOME, AWESOME big sister! 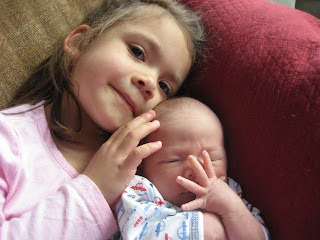 So far, she seems to be adjusting to Will's presence in the house perfectly fine. 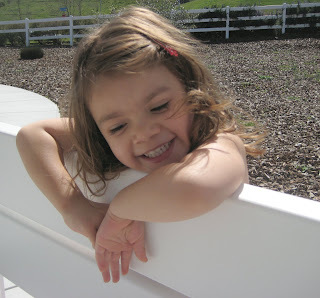 In fact, yesterday she was staring at him and looked up and me and said, "Mommy? Can we keep him?" 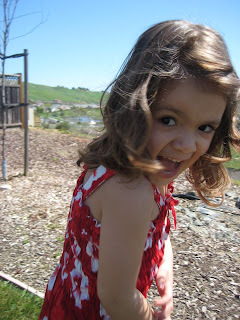 Then today in the middle of eating her lunch she said, "Mommy--we're a happy family, huh?" Kids...they say the darndest things. 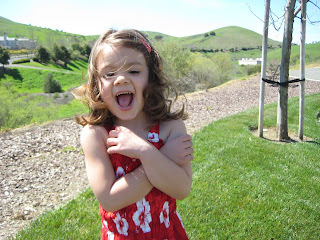 Everyone talked about the older sibling "regressing" with things like potty training, sleeping, etc. SO FAR, that hasn't been the case. I hope it continues!! First walk...Will was not thrilled sitting in the stroller! He's too small for the carseat! 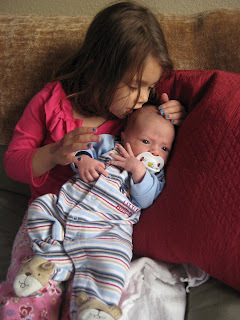 Today was our first day with Baby Will in the house. It is amazing to finally have him home!! 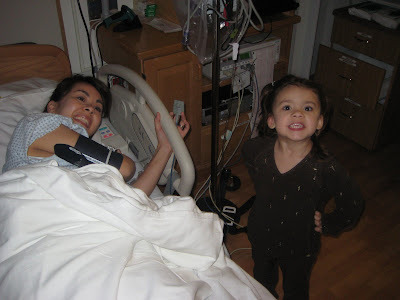 I prepared myself for a lot of things with this birth--not getting the epidural in time, the possibility of a C-Section, heart defects (even though the Drs. 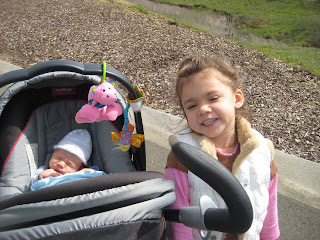 said everything was OK), having the baby come so fast I delivered on the side of the road--the list goes on! 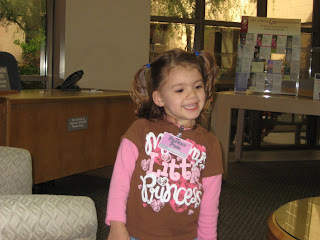 But never in a million years did I prepare myself for the possibility that my kid would not leave the hospital with us. Although it was traumatic for us, spending 2 weeks in a Level 3 NICU teaches you to truly appreciate everything you have. 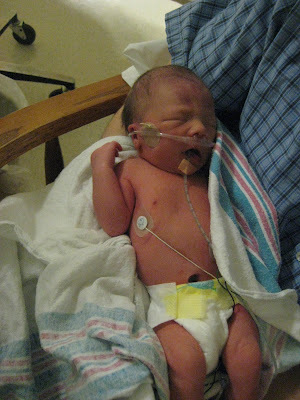 We met parents whose little boy was born at 25 weeks. For us, Will needed a little extra help for a few weeks and now he's fine. 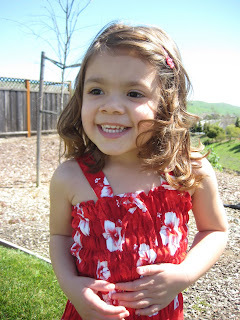 For them, they are preparing for a lifetime of raising a special needs child. That puts it all into perspective. At any rate, we are thrilled to have him home!! 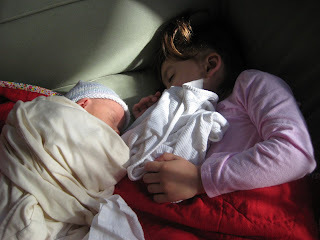 Day 1 of Mommy-of-Two duty was pretty easy. 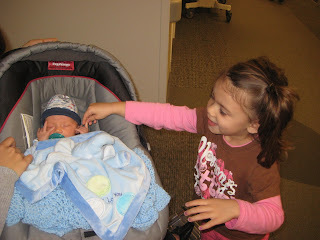 Brooke is an amazing helper and Will is just a little angel. 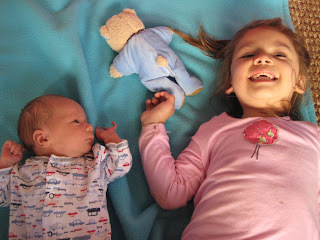 I'm sure at some point, the newborn bliss will wear off, but right now we're just enjoying everything we've got!! 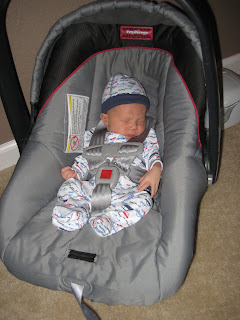 SOOOOO tiny in his carseat!! 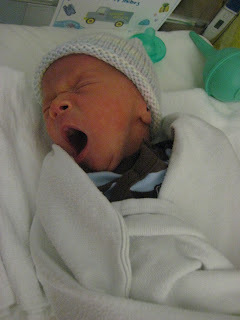 We got word late yesterday that Baby Will had graduated from the NICU!! 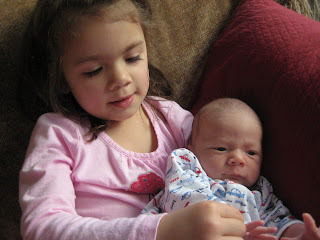 We were all THRILLED to have him home last night--especially Big Sister Brooke! 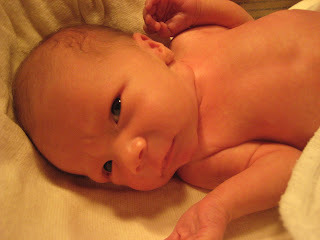 So far, he's an angel baby--he never cries!!! I'll post pics soon!!! I am all fresh and clean now that I visited Mommy's Spa yesterday. 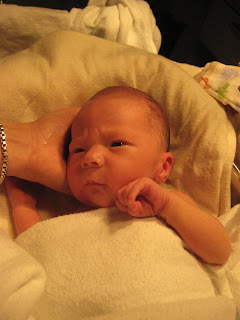 I wasn't too happy when she woke me up from my deep sleep, but I loved the warm water and being under the heat lamps. I fell back asleep 2 minutes after my bath. Ahhhhh....life is good. Also, see my forehead crinkles in the pic on the right? That is my "concerned/stressed out" look. I got it from Daddy. 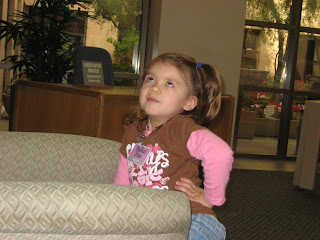 Mommy tells me I'll need Botox by Age 2!! 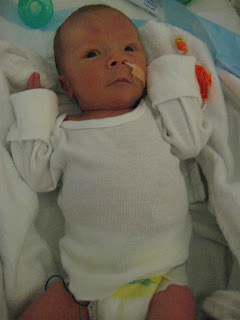 Little Will got his feeding tube taken out today--woo hoo!! 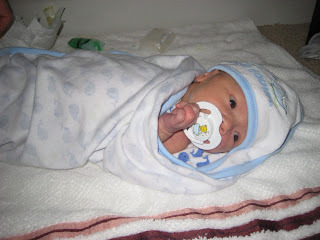 He's been taking all his feedings with a bottle and doing really well! We pray he keeps it up so they don't have to put it back in! 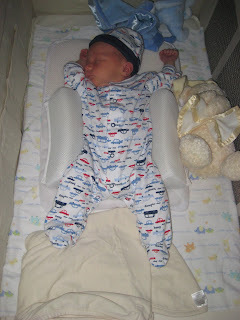 He also gained a whopping 2 oz. last night. If he continues to do well, he'll most likely be home in a couple of days!!! 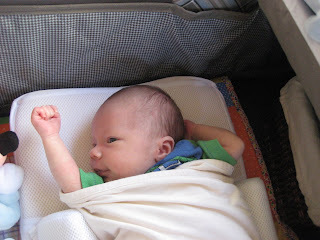 Little Will (aka: "Little Buddy" has seemed to be his nickname in the hospital) is doing great! He's off oxygen, his IV, antibiotics and whatever other crazy things he has had to endure for the past week. All that is left is his feeding tube that he uses to get calories because he's been too sleepy to eat enough to put any meat on his bones! He's getting a lot better with bottle feeding but they won't release him until he's had 24 hour of straight non-tube feedings. Although it's heartbreaking not to have him home, I'd rather him gain his strength and weight in the hospital where they can keep a close eye on him. Will-have only heard him cry twice and not at all today after his cicumcision! 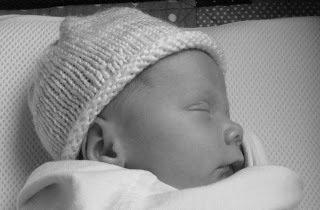 Scott and I welcomed William Riley (we will call him Will) into the world in the wee hours Friday morning, March 6th--3 weeks earlier than his due date and 2 weeks earlier than his scheduled induction. 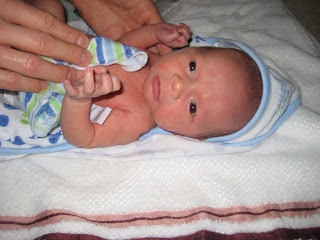 He was 5lbs, 12oz and 19 3/4 inches long. He's having a little bit of trouble getting adjusted to his crazy new world, so he's having to spend some time here in the NICU at John Muir. He's improved a lot over the last 24 hours and we'll probably be able to bring him home in about 3-4 days if he continues to do well. 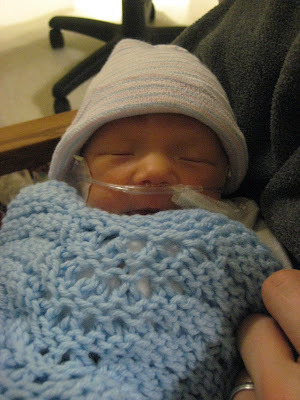 His lungs are fully developed, he just needs a little help breathing on his own. 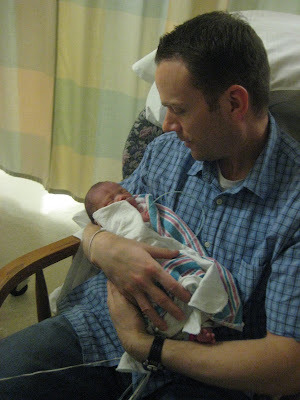 Scott got to hold him for the first time today and we're trying to spend some quality time with him in the nursery. 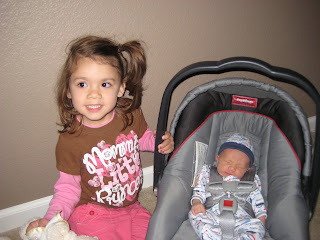 Big Sister Brooke has not been able to meet him yet, but of course keeps asking where he is! I didn't even think I was really in labor--just kept having "Braxton Hicks contractions" every 10 minutes or so :-) My Dr. happened to be on call at the hospital, so we decided at 10pm to just drop in and get checked. He was born at 3:54am!! 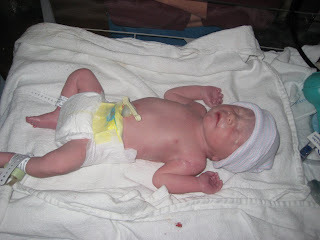 Even with a semi botched epidural, labor was quick and painless. However, it turned out he was "sunny side up" (face up) so it was almost impossible for me to push him out--he got stuck! His heart rate started to go down, so they sucked him out with the vacuum! Exciting stuff! And here I thought he'd just pop right out since he'd be so small. At any rate, we're all doing fine and can't wait to bring him home as soon as he's well enough. 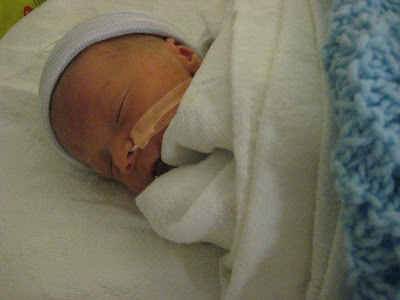 Here are some pics of him in the NICU.